There’s no Fireball puzzle today. Maybe it would have helped if I remembered the title while solving. When I glanced at the title before the solve, I guessed correctly what the theme would be, but by the time I actually started, that little thought had flown out of my head. No matter, despite being befuddled by the theme during the solve, I finished, and it all made sense afterwards. The common phrases in each theme answer all contain the bigram IT, but the clue requires you to read the entry without IT. 17a [Hairstyles by cosmetology students?] LEARNER’S PERMITS. …perms. 29a [Dietitian’s buffet tip?] ZERO GRAVITY. …gravy. 45a [Headline about Hilton’s claim against a guest?] HOTEL SUITES. …Sues. 59a [Undercover operation in front of the United Nations?] FLAGPOLE SITTING. …sting. This entry makes me think of the book I’m currently reading (i.e. listening to the Audiobook version of), The Accidental Further Adventures of the 100-Year-Old Man. There’s a scene outside the U.N. in which the old man and his young (66-year-old) buddy conspire to unload a briefcase full of uranium (which they stole from Kim Jong-Un) onto the unwitting ambassador from Germany. They were going to give it to Trump, but managed to think better of it. If you like zany farces and dislike Trump, I would highly recommend this and its predecessor, The 100-Year-Old Man Who Climbed Out the Window and Disappeared, both by Swedish author Jonas Jonasson. Despite the fact that “pole sitting” seems more common to me, this works well. There are a lot of phrases using “it” that could be bases for themes (“lose it,” “drop it,” “give it to me,” etc.). “Just ignore it” joins this list, and it could lend itself to a fun “a-ha” moment if you were none the wiser to begin with. Moving on to the fill, I had trouble with the spelling of YANGTZE (no doubt because I’ve been ruined by the game Yahtzee). 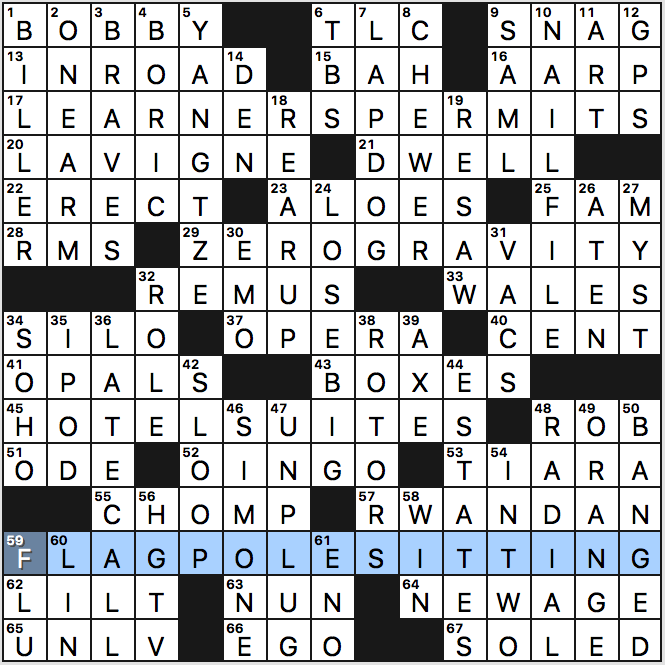 I managed to spell the crossing LAVIGNE correctly, but I wonder if that G caused some grief among solvers. Other goodies: NAIL FILE, LOSE BIG, RWANDAN, LAPDOG. What say you to LATE CALL? I like the entry, but it’s clued [Game-deciding judgment] which, I think, is saying it’s a decision made late in the game. That’s not how I normally hear that phrase. To me, it means a penalty that a ref or ump calls well after the play is over. Or am I conflating it with “late flag” in football? No doubt, that’s all part of the late-in-the-week design in which ambiguous clues are there to slow you down. 16a [Org. that turned 60 in 2018]. AARP. Cute. That little tidbit of information made the difference for me in this entry. 53a [Prom accessory]. TIARA. Most prom-goers don’t wear one of these. In fact, isn’t usually just one person per prom? Still, I guess the clue’s not wrong. 63a [Woman with her habits in order?]. NUN. 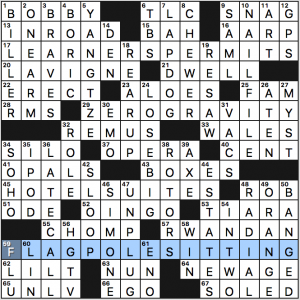 I think it’s a cruciverbial law that this word must have a “habit” pun in the clue. 11d [It might be a bust]. ART. Nice. And 3d [Little suckers?]. VACS. Also nice, though I’m sure I’ve seen it before. 59d [Cold kin]. FLU. Of all the ambiguous clues in the grid, this was probably the ambiugousest. But it’s Thursday, so it’s all good. Good grid with plenty of juicy fill. 3.8 stars. 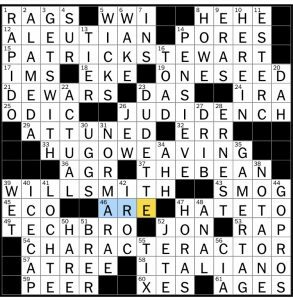 Hello crossword friends! Starting in March, Andy and I are going to be swapping who covers the NYT and BEQ Thursday puzzles. He’s out on vacation this week, so I’m filling in as a nice ramp up to that. My brain really wanted to stick JEAN-LUC PICARD there. And that’s that! It’s an unusually straightforward theme for an NYT Thursday, and I don’t have much to say on it beyond that. Looking at the other fill, which I’d want to be pretty clean on a concept as straightforward as this, the short fill could be a little better. WWI, HEHE, IMS, EKE, DAS, IRA, ODIC, AGR, ECO, and XES are structurally necessary for some of what’s going on in the crossings. I liked some of the longer downs like PENSIEVE, NORMA RAE, ICE CAP, and swimmer Ryan LOCHTE. Not a fan of DUDETTE – I associate that term with gross TECH BRO behaviors that prioritize being one of the guys that too often keep women out of those fields. That does it for this week – goodnight, my insomniacs. This puzzle reminds me that I haven’t eaten yet today. 17A [Half shell appetizer topped with bacon] CLAMS CASINO. 28A [Dessert with a stale ingredient] BREAD PUDDING. 44A [Stuffed, leafy entree] CABBAGE ROLLS. 58A [Financially greedy, or a hint to 17-, 28- and 44-Across] MONEY HUNGRY. 11D [College event incentive] FREE PIZZA and 34D [Head of Chiquita?] TOP BANANA. My college never offered me free pizza. Did I miss out on something? Damn. Fun puzzle, but I feel like I saw this same theme very recently. A quick search doesn’t turn up anything though, and it didn’t hinder my enjoyment. This theme flies under the radar more than most. For starters, it’s all in the down answers. Also, the thematic parts aren’t circled, so they’re more cryptic than is typical in the LA Times. The revealer is the central JUICEUP, and four juices are hidden running backwards from bottom to top in four long down entries. I appreciated that only two of the four were fruits, with one vegetable and one animal mixing up the flavours (even if clam juice is disgusting). [Blue, on the Danube], BLAU seems like a dupe, since the two are cognates. [Chicago-style pizza chain, informally], UNOS. Can our blog host and Chicago expert weigh in here? [Edible elephant, say], ANIMALCRACKER. Musical interlude. [Skillet dish with ham and peppers], WESTERNOMELET. Sounds intriguing. Regular omelets are something I find impossible to make. Everyone tells me scrambled egg without the scrambling, but they’re always a flop. In this case, RIGHT ON THE MONEY, SIGN LANGUAGE, MINESWEEPERS, and WHITE PRIVILEGE all get a little tweak. This entry was posted in Daily Puzzles and tagged Brendan Emmett Quigley, Greg Johnson, Peter A. Collins, Peter Collins, Sam Trabucco, Samuel A. Donaldson. Bookmark the permalink. Imo the NYT is exhibit A of “why to not take the average rating very seriously”. Not sure how it’d rate on another day (it’s problematic if you aren’t familiar with the movies and/or actors ) but it’s lacking for a Thursday IMO. It was problematic for those who don’t watch action movies. Hope I remember the trivia for the next time these show up! But perhaps a constructor ought to take the low ratings seriously, Brian. Universal – Interesting how a lot of slang terms for money have to do with food. In addition to those used, dough and cheddar come to mind. I’m sure others can think of more. What about in other cultures? I wonder if this comes from the days when barter was a common form of payment. 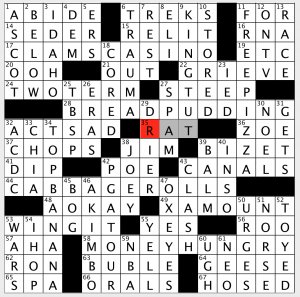 Money grubbing is probably a reference to animals rooting in the ground for food, but as I did the puzzle, it struck me that we also use the term grub as slang for food. I don’t believe I’ve ever heard Professor X referred to simply as “X”. Seems like that themer was really shoehorned in. Disappointing puzzle for a Thursday, IMO. I knew the actors, but I thought the fill in general was trivia-heavy and awkward — the corner with PENSIEVE (huh?) and ESTERC (huh?) and ONESEED (does anyone say that?) and ERAS (which don’t have to be ‘really long’) was particularly bad. 11D:ESTER-C was new to me. It makes sense since vitamin C is acidic (“ascorbic acid”(*) — you can certainly taste the acidity), but an ester would be pH-neutral. Though it seems that the actual product is calcium ascorbate, which does have neutral pH (so the clue is accurate) but is not an ester (so the name is not). I suppose a puzzle with such an ambitious grid (70 words, including 5 theme entries) has to resort to entries such as this and 1A:RÁPIDO (my first guess despite the misdirecting clue, but it took me a while to believe it). For that matter I wonder about the 58A:ITALIANO clue: I thought that at the time there was no single “Italian” language, and Dante’s use of one of the local dialects (I see it’s Tuscan) helped establish it as the standard one. (*) so called because it’s an acid that prevents scurvy. Even though you didn’t bother to identify which puzzle you are referring to, I am going to assume you are referring to the New York Times one, since New Yorkers seem to think the world revolves around New York to the exclusion of all else. It’s a bad habit that distinguishes the comments here nearly every day, so please don’t take my jab personally. I’ve just grown tired enough of the practice to actually say something about it today. When people don’t indicate which puzzle they’re referring to it’s a waste of time for everyone else as we try to isolate/scan the comments for the puzzle(s) we’ve chosen to solve on any given day. So there’s that aggravation in addition to the presumed supremacy of the NYT puzzle. Thanks for saying this. It’s a pet peeves of mine as well. Yes it was the NYTimes. 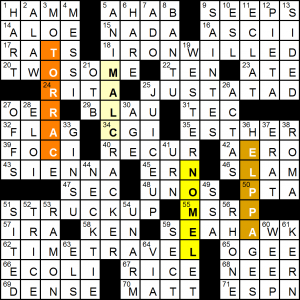 I usually try to specify the crossword I’m commenting on (esp. since sometimes it’s the CHE) — is it worth doing so even in reply to another commenter who didn’t bother? I should have mentioned that PENSIEVE was at least clued so that a solver could get some corroboration (it’s a sieve that catches thoughts), while most name clues give no further click than (at most) “yes, this might be a name”. Universal: a cute theme. Too bad it wasn’t used in a more challenging puzzle. The two long downs are also food-related, but don’t fit the theme, which makes me wonder whether the constructor was originally going somewhere else. Monday-easy clues: Venice waterways, V birds, Pocatello’s state, Pancake chain. I like a Thursday puzzle that puts up a stiffer fight. The puzzle was accepted before the Puzzle Society became Universal Crossword. Universal puzzles are now clued easier. My original tougher clues had to be changed. The other food-related entries were a happy accident. Just happened that way. Doug, thanks for solving; Greg, thanks for chiming in! 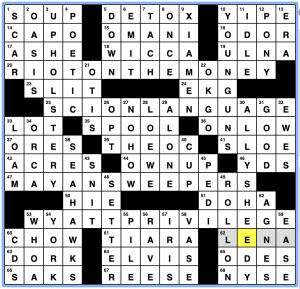 I’ll add that the Universal Crossword is meant to be the same difficulty every day, so a Thursday shouldn’t put up any more of a fight than a Monday. I had absolutely no idea who 33A was in the NYT. All crossings. Just so you know that just about everyone has knowledge canyons (not just gaps) somewhere. The fun is in trying to fill those, teaspoon by teaspoon;). I know him as Elrond from The Lord of the Rings films.